Formworks is a cloud-based forms and workflow automation solution which allows users to create dynamic web and mobile forms and custom workflows for data collection, aggregation, routing, and escalation. The software is designed for use across a range of sectors including financial services, sales, construction, property and facilities management, maintenance, logistics, education and training, and care. With Formworks, users can create custom mobile and web forms which replicate complex data capture processes through the drag-and-drop editor. More than 20 field types are supported, including barcode reading and time stamped signature capture, and rich multimedia processing enables the capture of text, sketches, photos, and audio. Pre-fill functionality allows users to send out partially-completed forms to specific users. Local databases containing lists of products, prices, SKUs, parts, assets, or clients can be accessed online or offline, enabling accurate form filling from anywhere. Any data entered offline is securely stored on the device and queues for submission once connection is restored. Formworks includes digital workflow automation tools, allowing users to manage data capture and business process automations. Completed forms can be routed automatically to admin teams or managers for validation or sign-off, and information can be escalated automatically to specific team members based on outcomes. Formworks also offers Cloud Hub, which stores all form data and enables real-time form activity tracking, multi-format data downloads, ad hoc and scheduled reporting, data search and filtering, and more. We have been using Formworks in one way or another for nearly 10 years and it has allowed us to move forward with data collection and processing without the need to have forms printed in bulk and wasted when changes are required. The flexibility of the data being in XML meanss we can manipulate and process the data with ease. No more print costs and waste. Build your forms quickly and modify them when you need to. Published and in the field in minutes. No more print costs and waste. Build your forms quickly and modify them when you need to. Published and in the field in minutes. Some knowledge of LUA and JAVA is necesary for form development however once created the administration is quite easy. Works well in the field, possibilities to export data from forms via FTP or direct to Azure The possible to build easy to use and at the same time advanced forms. The possible to build easy to use and at the same time advanced forms. Less staff required, less duplicated data entry, actual money saved.Nothing out there has the "look and feel" of these forms. Nothing out there has the "look and feel" of these forms. It is still early days so for now, nothing. Contact Digital Field Solutions for pricing information. Formworks’s digital workflow automation tools can be used to automate a variety of processes, including authorizations and approvals, contact center workflows, and internal paperwork through configurable dynamic forms and the built-in scripting engine. Drag-and-drop form configuration allows users to build mobile forms which replicate complex data capture processes, with multimedia processing enabling the capture of photos, sketches, audio and text. With pre-fill functionality, forms can be sent out to users in a partially-completed state to save time, and lists of products, SKUs, parts, assets, clients, and prices can be accessed in secure local databases when completing forms. Forms and local databases can be accessed offline, allowing users to fill in forms from anywhere, with all entered data queued for submission once connection is restored. The Formworks Cloud Hub stores all captured data and enables data analysis and reporting with a real-time activity dashboard, ad hoc and scheduled reporting, search and filtering, multi-format data download, and more. Below are some frequently asked questions for Formworks. Q. What type of pricing plans does Formworks offer? Q. Who are the typical users of Formworks? Q. What languages does Formworks support? Q. Does Formworks support mobile devices? Q. 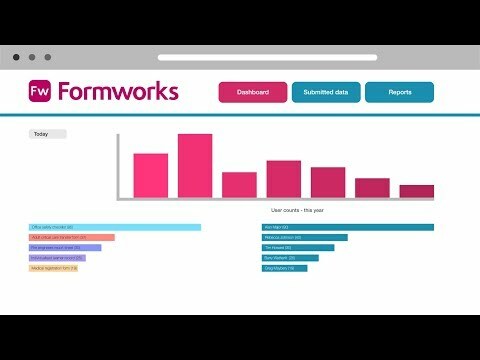 Does Formworks offer an API? No, Formworks does not have an API available. Q. What other apps does Formworks integrate with? Q. What level of support does Formworks offer?